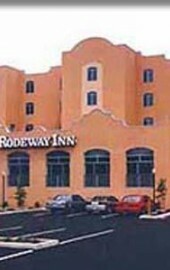 The Rodeway Inn® Oceanfront is conveniently located one block from the Ocean City Boardwalk on beautiful Ocean City Beach. The Roland E. Powell Convention Center is less than one mile away. 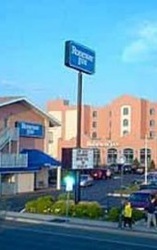 This Ocean City hotel is minutes from the Assateague Island National Seashore, Jolly Roger Amusement Park and the Ocean Downs Racetrack. Ocean City and its surrounding area are a golfer's paradise. Several courses are minutes from the hotel, including Eagle's Landing Golf Club, Ocean City Golf & Yacht Club, and the Ocean Pines Golf Course and Country Club. The Ocean City Municipal Airport is less than eight miles from the hotel. A variety of restaurants, cocktail lounges, entertainment options and shops are within walking distance. 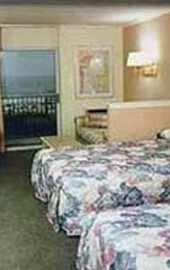 Guests of this Ocean City hotel will enjoy amenities and features like free continental breakfast and free coffee. After a long day, relax in the oceanfront indoor/outdoor heated pool with sundeck.